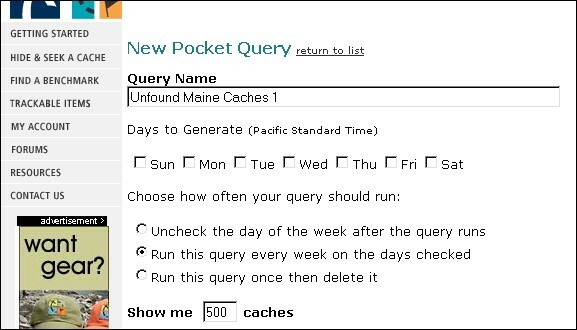 This subject of a method of getting PQs of all your unfound Maine caches without overlapping or getting duplicates comes up now and then so I thought I'd make it an article so it will be easy for all to utilize. I have seen people ask about getting all the caches for the great state of Maine to put in GSAK. Well I have gone over the dates and here is what I have. There have been a few changes so I have updated the process to run the Get Mail process via GSAK. Several times a week I update all unfound caches in my Home area. Depending on the day of the week I have between 2 and 5 PQ’s that are generated by GC.com. Once you have your PQ’s set up properly and you are receiving the proper information you should be ready to tackle the GSAK settings.